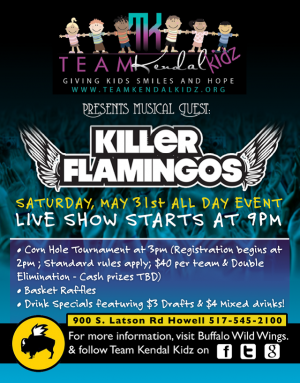 THE KILLER FLAMINGO'S WILL BE PLAYING OUR TENT EVENT THIS YEAR!!!!! 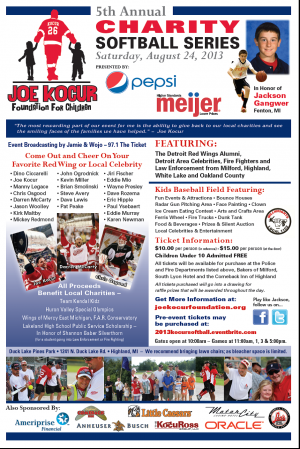 Mark your calendars for Saturday May 31st. 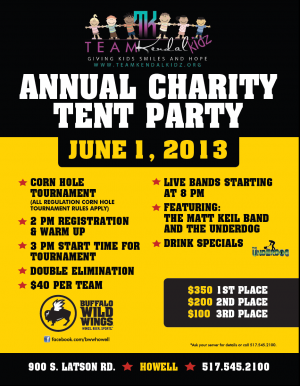 This year our Annual Big Tent Event at Buffalo Wild Wings in Howell is going to be AWESOME! 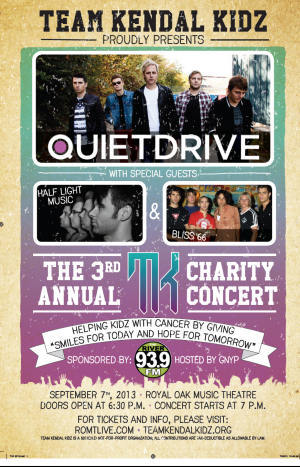 A HUGE thank you to the Royal Oak Music Theatre, Quietdrive, Bliss 66, Half Light Music, Gnyp & 93.9 The River, DJ Urban Kris, our sponsors and to ALL OF YOU who came out and supported TKK last night. It was an absolutely AMAZING night. The bands rocked the house with DJ Urban Kris spinning the tunes in between. Gnyp kept us entertained throughout while people danced the night away. If you haven't purchased your tickets yet no worries, they are available at the door for the same price. It's going to be an AMAZING night that you DO NOT WANT TO MISS! 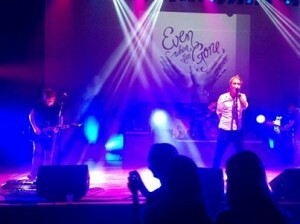 Quietdrive will be performing their new single "Even When I'm Gone". Check out our events page for more information about the event. PLEASE PLEASE ATTEND. It is a simple cheek swab that may very well save the life of someone you know someday. Visit the link above for more information. See you there!